The project dealing with colour music and colour hearing focuses on the examination of this phenomenon through live audiovisual performances, film projections, lectures and a supporting catalogue. The programme will reflect on current forms of technological interconnection between visual and audio components. The project will historically examine the period from 19th century production through the first generation of the Bauhaus Academy up to the present time, which is represented by mathematically accurate music with a visual component. Projections of films by Oskar Fischinger, Mary Ellen Bute and German absolute film, Tomáš Pospiszyl's presentation on Zdeněk Pešánek, live performance by Carsten Nicolai aka Alva Noto, George Bagdasarov and others are currently being negotiated. In his musical development,Georgij Bagdasarov went through punk and techno and ended with free improvisation with found and preserved objects. His audiovisual projects are characterized as reminiscences; he emphasizes the material nature of media and he works with references to the history of cinematography. This most popular current audiovisual artist is going to perform in the Czech Republic for the first time. Within the Unitxt project he works, for example, with the transfer of data from such Office programmes as Word and Excel into audio material. The audiovisual performance opens with the mechanically dehumanized voice of the French poet Anne-James Chaton, who reads out the contents of Carsten Nicolai, aka Alva Noto’s purse. The roughness of civilising data is rhythmised and kinetically visualised into a gradually developing story of discovering beauty in the sounds and images of the original information. In psychology Synaesthesia is characterised as the phenomenon of the crossing of the senses and it is quite rare. Colour vision from sound and music are among the forms of its manifestation. Psychologist Romana Láchová’s lecture will include a theoretical section explaining synaesthesia’s origins, variations and laws. However, more detailed attention will be focused on the synaesthetic tendencies of ordinal-linguistic personification. This block’s themes are the visual and energetic effects of colour and their relationship to musical dynamics. With regard to continuing in the tradition of work by Hans Richter, Oskar Fischinger and Harry Smith, we can speak not only about “animated painting”, but also about comprehensive, usually computer generated forms. Videos by Barbara Doser, Michaela Schwentner and Tina Frank will be introduced. In his lecture on “the first Czech audiovisual artist“, Zdeněk Pešánek, Tomáš Pospiszyl will focus on the analysis of his colour pianos and luminous librettos whose reconstruction was prepared by contemporary artist Federico Díaz. Tomáš Pospiszyl is a curator and theorist of fine arts and he publishes in many Czech periodicals. He currently works as a teacher at FAMU in Prague. As part of their commentated projection Matěj Strnad and Georgij Bagdasarov will focus primarily on the historical stage in avant-garde film's development that followed the Berlin matinee of Der Absolute Film in May 1925. Films by Viking Eggeling and Hans Richter will be shown as part of the projection. Questions will arise concerning the digital reconstruction of these "rhythmic" avant-garde pieces of work. 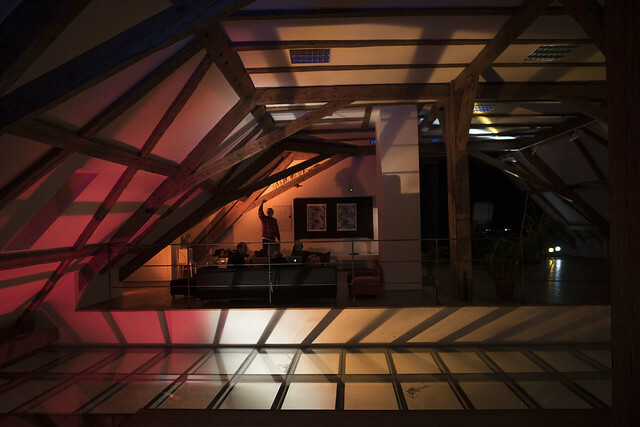 Elektrabel is a Czech artist and music producer who is well-known, especially in the context of the world dance scene. Andrej Boleslavsky is, in the long term, dealing with interactive applications and processing. Elektrabel’s audiovisual programme is especially prepared for one of PAF’s auditoriums that is not a slippery dance floor and does not suffer from the passivity of film rows. Poème électronique (1958) is one of the first comprehensive multimedia works which consistently uses the control of electroacoustic material’s motion in architectural space. This work was intended as a presentation for the Philips company based in Eindhoven and it was arranged by the three artists – Le Corbusier, Edgard Varèse a Iannis Xenakis. The fact that the Poème électronique has a key role in the history of electroacoustic music and media art is supported, not only by extensive foreign-language literature, but also by various attempts at physical as well as virtual reconstruction of this project. Kateřina Pacíková’s lecture “Static Composition, Lattice, Genesis - an Audiovisual Trilogy by Alois Piňos and Dalibor Chatrný” will include the projection of three experimental films Lattice (10:32), Genesis (8:12), Static Composition (13:52). Graphical component – Dalibor Chatrný; music – Alois Piňos; film – Dalimil Řehák; 1970. These three pieces of work are interesting both from the point of view of the original composition in the use of technical options and from the point of view of the specific form of the sound and visual components.